In a pioneering study published today, the IRR takes a fresh look at the nature of racial hate crimes since the referendum. Through a detailed examination of cases on the IRR’s unique database it establishes a link between the language and behaviour of perpetrators of such violence, the rhetoric and policy pronouncements of politicians over recent years and the stigmatising frameworks of the media. ‘It is convenient to condemn the “spike” in violence this summer as the acts of a thuggish minority, but an examination of over one hundred cases shows a link between the language and behaviour of perpetrators and the rhetoric and policy pronouncement of politicians’, said IRR researcher, Dr. Jon Burnett. The racism evidenced in attacks revealed the following in perpetrators: an affirmation the country was theirs again; cultural norms could be reasserted; racism was linked to ‘entitlement’; anti-migrant and anti-Muslim racism intersected; new racisms rooted in former racisms. Above all, the briefing paper states, the attacks had their gestation within policy measures which expressed the same aim/sentiments as the abuse witnessed in June/July 2016. Of the 134 incidents (which ranged from graffiti on public buildings to stabbings) examined in this research, 84 per cent took place in England, 7 per cent in Northern Ireland, 6 per cent Wales and 3 per cent Scotland. Seventy-five per cent of all cases involved interpersonal racial abuse and 70 per cent of perpetrators were known to be white and British. Where the ethnicity/background of victims was known, 22 per cent were Muslim and 21 per cent eastern European. Racial violence and the Brexit state provides a much needed context to the ‘hate crime’ debate. It not only accounts for and analyses media-reported attacks over one month but also examines the nature of the close relationship between the police and the media at the expense of the victims – whose voices are rarely heard. It points to the damage done when racial violence is divorced from social considerations and discussed only as a law-and-order problem. But it goes further, pointing to the danger to race relations in the UK if discrimination takes hold in law and policy. In a foreword, A. Sivanandan, who first drew attention to discriminatory state practices in the 1970s and ’80s, warns the government against giving ‘a fillip to popular racism’ by ‘elevating institutional racism to fully-fledged state racism’. He points out that ‘the difference today is that racism and xenophobia have become tied into the state itself, making nativism the state ideology and “take back control” its political culture’. Notes: 1. 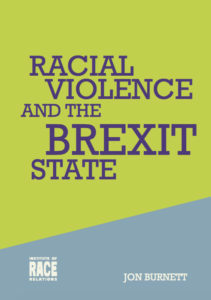 Racial violence and the Brexit state can be downloaded here (pdf file 784kb.) 2. The research from IRR’s unique multi-facetted database provides details on 134 racial attacks between 24 June and 23 July 2016. 3. The paper provides an account of government pronouncements and policies on race, religion and migration since 2011. 3. A close examination is made of the way that the media source their stories about racial attacks and the role of the police in constructing the narrative about such violence. 4. The opposition to such violence, in terms of a sample of positive neighbourhood solidarity actions is given. 5. Contains photographs, charts, graphs and infographics. 5. Author Dr Jon Burnett works as a researcher at the Institute of Race Relations and can be contacted at: jon@irr.org.uk. For all the pretend concern from the ‘left liberal’ white middle class for refugees and immigrants, 7 out of 8 refugees end up in poverty stricken run down areas where people are already struggling for housing, jobs, school places and the like. Middle class liberals seem concerned, as long as it doesn’t affect them personally. And if the media is stoking and politicians are stoking up racism, would that be because the majority of those in the media and politics are now almost exclusively white and middle class, privileged and educated? People who think they are naturally superior to other groups, just like the racists they say they abhor?